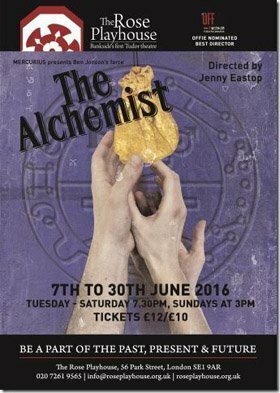 This energetic and vibrant Mercurius production condenses the five acts of Ben Jonson’s The Alchemist into 90 minutes – by comparison the Royal Shakespeare Company’s production, which at the time of writing is playing in Stratford-upon- Avon and transfers to the Barbican Theatre in London in September 2016, runs at 2 hours and 20 minutes not including interval. And yet, it doesn’t feel as though anything is missing: just when I thought they might skip over a few lines spoken by a number of unnamed periphery characters at the start of Act V (the RSC’s cast is 20-strong, against Mercurius’ 8), they’ve found a way of getting all the lines in question in. It’s deliberately complicated, at least to begin with, as there’s not much of a prequel beyond a bizarre (in this particular production) piece of music that was completely out of place, especially as the play itself has not otherwise been re-imagined from its original setting of 1610. Even now I struggle to place what genre that piece of music was – a similar piece plays during one of the scene changes, and the first piece plays again at the curtain call. It wasn’t nightclub music, as I couldn’t imagine people dancing to it, and it seemed to me a slow rap with jarring instrumentals. But as I was saying, it starts off being rather complicated, as we are immediately plunged headfirst into a verbal spat between Face (Peter Wicks) and Subtle (an excellent Benjamin Garrison), and from there the audience must work out what exactly is going on. This continues throughout the play (the complexity, not the spat), but don’t be put off by this – the play is an examination of deception and what is real versus what is merely imagined, and there’s much fun to be had in working out who is whom as certain characters themselves take on other roles in order to beguile other characters. And yet more fun to be had in seeing the deceptions take place during the play, with varying degrees of success. I can’t fault the costumes in this production, certainly not in terms of style, except to say one or two garments did look like they had seen better days. But there is such a thing as pacing a play a tad too quickly, and here, not every joke lands perfectly. I hasten to add that most of them do, and in this regard Jeremy Booth’s Mammon (this is one of those plays where the character names are sometimes very strongly indicative of that character’s type and personality, without any prior knowledge of that character) and Monty d’Inverno’s Kastril make their lines sparkle with pleasure and confidence. We find the idea of the Philosopher’s Stone itself these days quite ridiculous, but the pursuit of wealth is still prevalent – arguably more so now than it was in Jonson’s day. The wider applications of the play’s themes are enormous – is, for example, as some of my friends and acquaintances believe, the National Lottery effectively a tax on the poor and/or gullible? As far as this production goes, I found it difficult to feel very much sympathy for the hoodwinked, even though I got Ben Jonson’s implied point that, with the world being what it is, I cannot say I am completely immune from being conned (indeed, I have been conned before, but that’s another story for another time). What was more vivid was the suggestion that the suspension of disbelief on entering a theatre leaves audiences open to being fooled into believing that preposterous plotlines are feasible. Like the characters who believe in the Philosopher’s Stone, the theatregoer temporarily believes in what is essentially false (a live theatrical production) because there just might be something (metaphorically) golden contained therein. The words of Ben Jonson’s literary contemporary William Shakespeare ring true – all the world is indeed a stage. This is a show that maintained my interest from beginning to end, another superb Mercurius production: I could even say it was golden. Or could I? Slapstick farce meets breath-taking word play in Ben Jonson’s much loved comedy. Wealthy Lovewit, fleeing disease-ridden London, leaves his town house safely in the care of his butler Jeremy. But Jeremy grabs the chance to set up a criminal den with two fellow swindlers, promising untold riches and success to the gullible. No scheme is too ridiculous, no dupe left untricked as the greedy of London flock to be gulled. But as the three juggle their increasingly crazy schemes will the bubbling cauldron of trickery explode in all their faces? And what will happen if Lovewit suddenly decides to come home?